The Sony Xperia Z1 Compact promises to be everything the big Z1 is except in a smaller package. The reduction in size, however, meant less room for the battery and the Z1 Compact has a 2,300mAh battery compared to a 3,000mAh battery for the big one. That’s still great for the class – the HTC One mini has a 1,800mAh battery and the two are roughly the same size. Sony is promising up to 18 hours of talk time, but our tests show that this is a conservative estimate. The Xperia Z1 Compact fell a little short of 21 hours talk time (on a 3G network), which is well above the next mini on the list (S4 mini duos). The Galaxy S4 mini (single-SIM) and HTC One mini are both around 12-13 hours. The Z1 Compact also did double what the iPhone 5s achieves. As the first proper Android mini flagship, the Z1 Compact offers an alternative for those wanting to switch from iOS but turned back into Apple’s arms by Android’s trend of huge phones. The Sony Xperia Z1 Compact has a smaller screen, which allowed Sony to drop the resolution to 720p without major damage to the screen sharpness. This also upped the battery efficiency in web browsing a great deal, the Z1 Compact is one of the best performers. The Galaxy S4 mini and iPhone 5s both last nearly three hours less. The Xperia Z1 has a bigger battery by around 30%, but the screen surface area is 35% bigger, not to mention that 1080p is nearly twice the pixels of 720p. This means the big Z1 burns through its battery in just under 6 hours. The video playback was problematic on the Xperia Z1 when it launched with Android 4.2.2, but the Xperia Z1 Compact comes with Android 4.3 out of the box and Sony has fixed up its codec support since then. It’s still not perfect though as the video player drained the battery in 10 hours. Note that we test the web browser till the phone dies, while some video players automatically exit at 10% charge so we stop the video test there. Factor in those extra 10% and the video playback time would be roughly on par with the web browsing time. For what it’s worth, the iPhone 5s rival is less than half an hour ahead and the Xperia Z1 once again turns in a lowly 10 hour score. 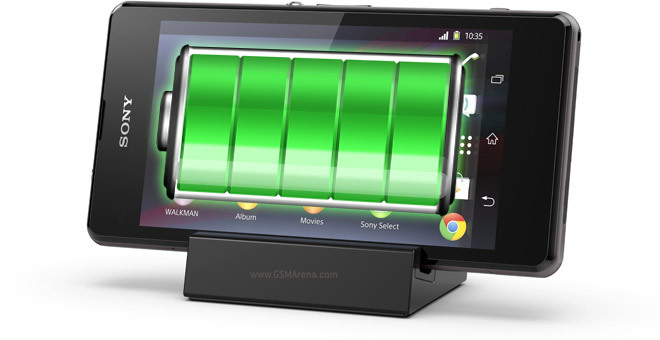 Overall we’re pretty impressed by the Sony Xperia Z1 Compact battery life. Part of that is because Sony managed to cram a relatively large battery in the device. The smaller, 720p screen also helped a good deal here. Sony made no compromises with the chipset and camera for the Z1 Compact and it turns out there’s no compromise with the battery life but an actual improvement instead! 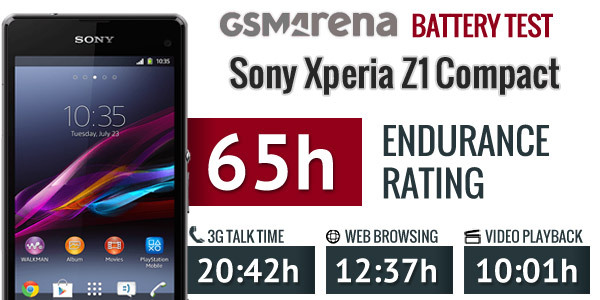 The Z1 Compact scores an endurance rating of 65 hours, compared to the 53 hours of the big Xperia Z1. It also managed to beat it where it counts – 6 hours of web browsing or videos is quite low for a flagship, while the difference between 21 hours of talk time and 27 hours is less important. The Sony Xperia Z1 Compact will get you through two days of usage, three if you use it moderately.